Chattanooga Tennessee has some of the best coffee out there, especially down Main Street. 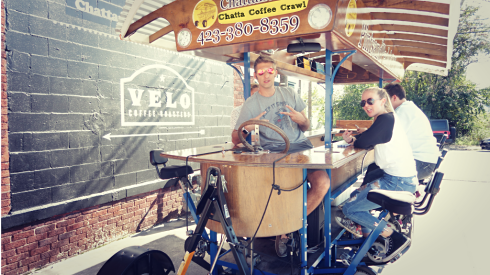 The Pints and Pedals Chattanooga Coffee Crawl will be every Saturday from 9:30 am to 11:30 am. 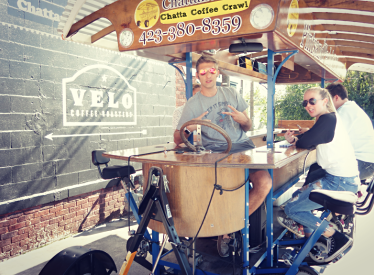 If you love exploring local coffee shops and bakeries; then this is the tour for you! We recommend this option for groups of 6 or more as it starts to get tough with anything less than that! Come with a group of 6 and you’ll most likely have 9 new friends by the end! We will be meeting at our new location at the Moxy Hotel. Moxy is a new addition to Chattanooga and our new partner. We will be located in Moxy's back parking lot. If you get there before us, go in and give the Moxy crew a shout out. Each stop, to make your experience even better, with your Coffee Crawl bracelet, you will get a discount to enjoy some of the best craftsman coffee, chocolate, and pastries. Every cup of coffee has a story to tell. We want to help bridge the gap between craftsman and connoisseurs like yourself while providing the best way to experience of it all. We look forward to showing you around our amazing city!